If you’re looking for home remedies for fever, you’ve come to the right place! As the mother of a 7-year-old child in full-time school, I’ve experienced my fair share of childhood illnesses over the years. From strep throat and UTIs, to stomach bugs and ear infections, to stubborn fevers that seemingly pop up out of nowhere and mysteriously disappear on their own, I sometimes feel as though school is designed specifically to keep children and their parents as sick as humanly possible from fall through spring. There are periods of time in which we seem to float from one illness to the next for weeks on end, and I’ve spent a lot of time researching home remedies for fever, sore throat, ear infections, stomach bugs and beyond to ensure I’m equipped and ready when a sickness threatens to take us down. You see, while I would prefer to dress my child in a hazmat suit before sending her off to school each day, the logical part of my brain knows that all of these illnesses she keeps bringing home are helping to build her immune system, and instead of pumping her full of medication at the first indication of sickness, I try to find home remedies to help keep her comfortable while her body does what it needs to do to fight off whatever’s plaguing her. Do I still medicate her when I need to? But before I expose her to a room full of sick kids at her doctor’s office to see if she needs antibiotics, or pump her full of over-the-counter (OTC) fever reducers, I try to take a step back and assess the situation so I can make an informed decision and do what’s best for her and her body. If you’re looking for information regarding fever in children – what it is, when to worry, and how to help a fever – I’ve laid it all out below. 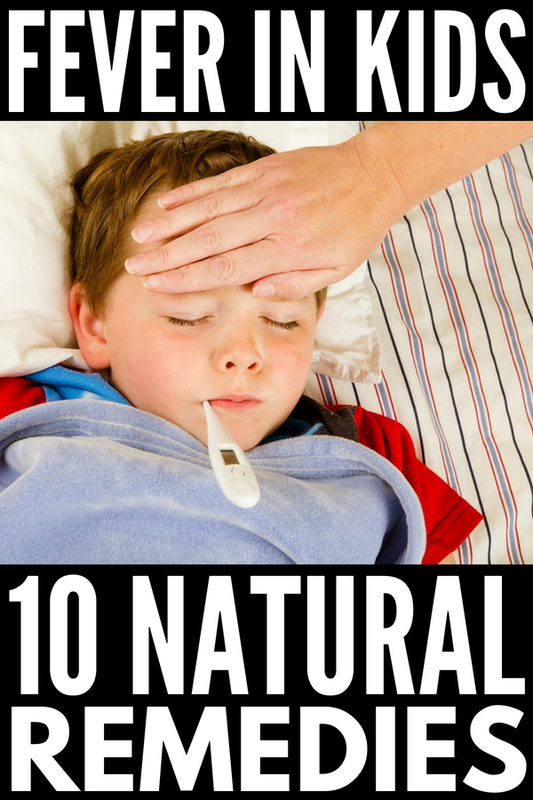 I’ve also included 10 home remedies for fever that my mom friends and I swear by to help keep kids comfortable when they’re feeling under the weather. Please remember that I’m not a doctor or naturopath, and that the information shared within this post should not (and is not intended to) replace the advice of a trained medical professional. Fever is the body’s natural defense against viral and/or bacterial infections. Our normal body temperature is about 37C / 98.6F, and a temperature over 39C / 102.2F indicates a fever is present, and that the body is trying to fight off an illness or infection. Immunizations and teething can also cause fever. It’s important to note that the severity of a child’s fever isn’t necessarily indicative of how sick she is. A child’s overall behavior and demeanor is a much better indicator. Is she alert, active, playing, and eating normally, or is she fussy, irritable, refusing food, and lacking energy? These are the kinds of questions your doctor will want you to answer when evaluating your child to try and determine the reason behind her fever. What are the Symptoms of Fever in Children? When Should I Worry About my Child’s Fever? Some of the online literature I’ve read suggests that parents and caregivers don’t need to worry as much when fever occurs in a baby older than 6 weeks of age, but I prefer to err on the side of caution. If your child is less than 12 weeks old and has a temperature greater than 38C / 100.4F, you should seek medical advice. Remember that a fever isn’t usually something to worry about and often goes away on its own. If your child is eating, drinking, playing, and generally in a good mood, you probably don’t need to be concerned, but if she’s lethargic, refusing to eat or drink, inconsolable, and/or just generally not acting like herself, a call to her doctor is in order, even if her fever is mild. While many parents prefer to help a fever with OTC medications like Tylenol and Advil the moment their child’s temperature increases, remember that fever is the body’s natural way of fighting off an illness or infection. There has been speculation that reducing a fever prematurely can actually prolong an illness, but many sources deny these suggestions and claims. Regardless of what your opinions may be, there’s no denying that OTC fever reducers can help reduce the body’s temperature quickly, and they certainly help to keep kids comfortable when they are sick. The trick is deciding if and when to use them. Again, I’m not a medical practitioner, so I cannot advise you either way, but since these home remedies for fever can be used with or without OTC medications to help a fever in kids (and adults), they are great ideas to keep in your back pocket to use when your child falls ill. When it comes to home remedies for fever, many online sources suggest you strip your child down and give her a lukewarm bath when fever strikes, but this may do more harm than good. If your child starts shivering, her body temperature will temporarily rise to compensate, making her fever worse, so I don’t recommend this as a natural fever reducer. And now, here are my best home remedies for fever to help kids feel better sooner! Keep them hydrated. Adequate hydration is the best way to help a fever and keep it under control in kids and adults. Keep a glass of water or another liquid your child enjoys handy at all times and encourage her to drink as often as possible. Frozen treats. If your little one is refusing liquids due to a sore throat or other illness that is accompanied by a fever and you worry she’ll dehydrate, consider offering popsicles, watermelon, frozen grapes, or another beverage she might enjoy. You can also make your own popsicles using your little one’s favorite fresh fruits, and Pedialyte Freezer Pops are another great choice as they contain sodium, potassium, and chloride, which help replenish electrolytes lost due to dehydration. Cold wet socks. When I asked my daughter’s naturopath for some natural remedies for fever, this was her first suggestion and I swear by it. Simply soak your child’s feet in warm water for about 5 minutes, and then apply a pair of polypropylene socks that have been soaked in ice water. Apply a pair of wool socks overtop of the wet socks, and send her to bed. Sounds crazy, I know, but wet sock treatment has been shown to help a fever by drawing the blood to the feet. Give it a try! Adjust the temperature. When my daughter is fighting a fever, I reduce the temperature of our home to help her feel more comfortable. I turn down the heat in the winter, make the air conditioner cooler in the summer, and I put a fan in her room to help keep her cool while she’s sleeping (I love our Honeywell Quietset Fan as it’s very quiet and doesn’t keep her awake). Cold washcloths. As mentioned above, I don’t like using lukewarm baths as a natural fever reducer as it can temporarily increase your child’s body temperature, making her fever worse, but when your little one is tucked up in bed or snoozing on the couch, placing cold compresses on her forehead or behind her neck can help her feel more comfortable while (hopefully) helping to reduce her temperature. Use less clothing and fewer blankets. This may seem obvious, but try to avoid dressing your child in multiple layers of clothes and/or wrapping her in a ton of blankets when she has a fever. Stick with one layer of clothing and one blanket so your little one doesn’t overheat. Probiotics. If you’re looking for home remedies for fever, probiotics are another great option to consider. Research suggests that 70% to 80% of our immune system is located in our gut, and that improving our gut flora through the consumption of probiotics can simultaneously improve our immune health and help shorten the length and severity of the symptoms we experience when we’re ill. Speak to a licensed naturopath to confirm which brand and potency will work best for your child. Homemade soups. While we don’t know the exact science behind why chicken noodle soup helps to reduce the duration of illnesses and makes us feel better sooner, encouraging your child to drink chicken noodle soup from a mug can help keep her hydrated and nourished when she’s under the weather. Add a little spice to your meals. One of my personal favorite home remedies for fever is to eat spicy food. The heat from the spices makes the body sweat, which in turn helps the body to cool down naturally. Of course, not all children can tolerate spicy foods, but if your little one will let you add a little cayenne pepper to her chicken noodle soup or her favorite mac and cheese recipe, it’s worth a try! Sleep. The last of my home remedies for fever is to encourage your child to get adequate rest and sleep so her body can fight off whatever caused the fever to occur in the first place. Let her doze on the couch while watching TV during the day, and take extra steps to help her sleep better at night. Dress her in a light layer of clothing, opt for only one light blanket, place a fan in her room, and do whatever else you need to do to keep her comfortable. Continue to monitor her fever, but don’t wake her unless you need to. I hope this collection of home remedies for fever proves useful to you! Remember that fever is the body’s natural defense against viral and bacterial infections, and that the severity of a fever isn’t necessarily indicative of how ill a child is. Pay attention to how your child is behaving, and use your best judgement. Always err on the side of caution and consult with your child’s doctor (or head to the nearest emergency room) when a fever strikes, follow all recommended guidelines when it comes to using OTC medications, and use these home remedies for fever to ensure added comfort and relief. If you found these home remedies for fever helpful, please share this post on Pinterest! And if you’re looking for more parenting tips and tricks, please follow our Parenting board where we share all kinds of helpful ideas we find each day!